(2010) "Today Was a Fairytale"
"Fearless" is a country pop song performed by American singer-songwriter Taylor Swift. The song was co-written by Swift in collaboration with Liz Rose and Hillary Lindsey and produced by Nathan Chapman and Swift. 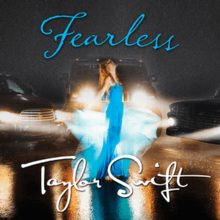 "Fearless" was released on January 3, 2010 by Big Machine Records as the fifth and final single from Swift's second studio album of the same name (2008). Swift composed the song while traveling on tour to promote her eponymous debut album, Taylor Swift (2006). She wrote "Fearless" in regard to the fearlessness of falling in love and eventually titled her second studio album after the song. Musically, it contains qualities commonly found in country pop music and, lyrically, is about a perfect first date. "Fearless" received acclaim from contemporary critics, many of whom complimented it for appealing to different age groups. In the United States, "Fearless" debuted and peaked at number 9 on the Billboard Hot 100 and was certified platinum by the Recording Industry Association of America (RIAA), and it was the first single to be certified gold by the RIAA before it was officially released as a single. "Fearless" also entered charts in Canada and Spain. Swift performed the song in various venues, some of which were included on the Fearless Tour (2009–10). Footage from the Fearless Tour performances were used to comprise a music video for "Fearless", directed by Todd Cassetty. The video features both footage of the tour itself and backstage. "Fearless" was written by Swift in collaboration with Liz Rose and Hillary Lindsey and produced by Nathan Chapman alongside Swift. Swift conceived the song while touring as opening act in order to promote her eponymous debut album, Taylor Swift (2006). While writing the song, she was not dating anyone or "even in the beginning stages of dating anybody." She wrote the song after she analyzed the ideology of what was the best first date. While developing "Fearless", Swift explained the writing process, stating, "I think sometimes when you’re writing love songs, you don’t write them about what you’re going through at the moment, you write about what you wish you had." The song was composed with two concepts in mind. Swift described the song's primary concept to be about "the fearlessness of falling in love", and "no matter how many times you get hurt, you will always fall in love again." The second, is about the best first date, which Swift stated she hadn't experienced at the time of writing "Fearless". After completing the song, Swift deeply deliberated her personal definition of the word "fearless". To her, "fearless doesn't mean you're completely unafraid and it doesn't mean that you're bulletproof. It means that you have a lot of fears, but you jump anyway." That influenced her to title the album Fearless. The song was first released as a promotional single from the album on October 14, 2008 as part of Countdown to Fearless an exclusive campaign by the iTunes Store; it was later released as the fifth and final single from Fearless on January 4, 2010. A 24 second sample of "Fearless" by Taylor Swift. "Fearless" is four minutes and one second in length. Alexis Petridis of The Guardian described the song's genre as a "kind of orthodontically perfect pop rock". He said the most country part of the song was a lyric that referenced a "one horse town". The song is set in common time and has a moderate tempo of 100 beats per minute. It is written in the key of F major and Swift's vocals span two octaves, from F3 to C5. It follows the chord progression F–C–Gm–B♭-C. Tom Ronald of Great American Country interpreted the song's message to be about "taking courage on the dating circuit." In a different perspective, Rob Sheffield of Blender magazine said the lyrics "And I don't know why but with you / I'd dance in a storm in my best dress, fearless" demonstrated how Swift enjoyed making a scene. He added that she would not wear "anything else to go ride around in a storm". "Fearless" received critical acclaim for its ability to relate to different age groups. Leah Greenblatt of Entertainment Weekly said Swift's vocals fit the song's melody and instrumentation, which, according to her, is "slick" and "radio-friendly". Heather Phares of Allmusic selected the track as one of the best songs on Fearless. Alice Fisher of the United Kingdom magazine The Observer congratulated "Fearless" for being one of Swift's "great songs with perceptive lyrics about universal truths that can be enjoyed at any age." Jim Harrington of The San Jose Mercury News believed "Fearless" contained appeal to different age groups: "Moms and daughters, as well as groups of teens and couples out for a date night, [can sing] along with equal gusto." Upon its release as a promotional single, on the week ending November 1, 2008, "Fearless" debuted and peaked at number nine on the Billboard Hot 100 with sales of 162,000 digital downloads, becoming Swift's third consecutive top ten song on the chart. In the succeeding week, the song fell to number 38 and after four weeks of roaming the Billboard Hot 100 it fell off the charts. Following its single release, the song re-entered the Billboard Hot 100 at number 94 on the week ending March 13, 2010. Its highest position on the chart while being released as a single was number 76 on the week ending April 10, 2010. The song is one of 13 songs from Fearless charted within the top 40 of the Billboard Hot 100, breaking the record for the most top 40 entries from a single album. "Fearless" spent a total of 15 weeks ascending and descending the Billboard Hot 100. "Fearless" also peaked at number ten on the Hot Country Songs, making this her tenth consecutive top ten hit but also her lowest-charting single, and number 18 on the now-defunct Pop 100. The single was certified gold by the Recording Industry Association of America (RIAA) for the purchase of over 500,000 digital downloads on October 12, 2009 before its official release as a single on January 4, 2010, it therefore became the first single to be released after being certified gold by the RIAA. "Fearless" was certified platinum by the RIAA on October 23, 2012, and has sold a million copies in the United States as of November 2017. On the week ending November 29, 2008, "Fearless" debuted and peaked at number sixty-nine in Canada, spending a total of five weeks on the chart. The song peaked at number thirty-two in Spain. Swift performing "Fearless" during her Fearless Tour in Austin, Texas. Swift's first televised performance of "Fearless" was on November 10, 2008 on the Late Show with David Letterman. She went on to perform the song on The Ellen DeGeneres Show and Clear Channel Communications's Stripped. Swift performed the song on all venues of her first headlining concert tour, the Fearless Tour, which extended from April 2009 to July 2010. During each performance, Swift escorted a silver sparkly dress and black boots and played an acoustic guitar as floral patterns with a moving butterfly were projected on the stage. Alice Fisher of The Observer attended the May 7, 2009 concert at Shepherd's Bush Empire in London and said that while Swift drifted off during the performance, it "clearly made perfect sense to the girls in the audience." Jocelyn Vena of MTV News reported that the audience loudly sang along to the performance of "Fearless" at the August 27, 2009 concert at Madison Square Garden in New York City. The song was also performed on the Speak Now World Tour, in a mashup with Jason Mraz's "I'm Yours" and Train's "Hey Soul Sister". Swift performed the song, acoustically, on selected dates during both The Red Tour and The 1989 World Tour. In 2018, she performed it, in place of "All Too Well", during the second East Rutherford show at Metlife Stadium on her Reputation Stadium Tour. Swift performing "Fearless" during her Reputation Stadium Tour in New Jersey. Various performances from the Fearless Tour were used to comprise a music video for "Fearless", directed by Todd Cassetty. The video premiered on February 17, 2010 on CMT. It begins when Swift tells her band before they step onstage, "You guys, this tour has been the best experience of my entire life." The video intermingles footage from the tour itself with fans excitedly showing off signs to Swift with behind-the-scenes footage of Swift and her band as they travel on the Fearless Tour. The video ends with the singer waving goodbye as she exits the stage. Upon watching the video, Jocelyn Vena of MTV News interpreted it to be "Swift's love letter to her fans", as it showed an "inside view of what it's like to go on tour". To date, the video has over 50 million views on YouTube. ^ "®R&R :: Going For Adds™ :: Country". radioandrecords.com. Archived from the original on 2015-02-09. ^ a b c d Swift, Taylor. "Cut By But". Bigmachinerecords.com. Big Machine Records. Archived from the original on April 3, 2010. Retrieved May 25, 2010. ^ a b Vena, Jocelyn (November 11, 2008). "Taylor Swift Says She 'Owed It' To Her Fans To Be Open About Joe Jonas Breakup". MTV News. Viacom. Retrieved May 25, 2010. ^ "Countdown to Fearless". iTunes Store. Apple, Inc. Retrieved May 25, 2010. ^ "R&R :: Going For Adds :: CHR/Country". Gfa.radioandrecords.com. Radio & Records. January 4, 2010. Retrieved May 25, 2010. ^ "Fearless > Overview". Allmusic. Rovi Corporation. Retrieved March 18, 2010. ^ Petridis, Alexis (March 6, 2009). "Taylor Swift: Fearless". The Guardian. Guardian Media Group. Retrieved May 30, 2010. ^ "Digital sheet music - Taylor Swift - Fearless". Musicnotes.com. Alfred Publishing. ^ a b Roland, Tom (December 17, 2009). "Taylor Swift "Fearless"-ly Sets A New Precedent". Great American Country. Scripps Networks Interactive. Retrieved May 25, 2010. ^ Sheffield, Rob (November 11, 2008). "Fearless". Blender. Alpha Media Group. Archived from the original on February 28, 2010. Retrieved May 25, 2010. ^ Greenblatt, Leah (November 5, 2008). "Fearless (2008)". Entertainment Weekly. Time Warner, Inc. Retrieved March 12, 2010. ^ "Fearless > Review". Allmusic. Rovi Corporation. Retrieved May 25, 2010. ^ a b Fisher, Alicer (May 10, 2009). "Enough to make you scream". The Observer. Guardian Media Group. Retrieved May 21, 2010. ^ Harrington, Jim (April 12, 2010). "Review: Taylor Swift at HP Pavilion". The San Jose Mercury News. MediaNews Group. Retrieved May 26, 2010. ^ Cohen, Jonathan (October 23, 2008). "T.I. Returns To No. 1 On The Hot 100". Billboard. Nielsen Business Media, Inc. Retrieved May 25, 2010. ^ a b c d "Fearless - Taylor Swift". Billboard. Nielsen Business Media, Inc. Retrieved May 25, 2010. ^ "Taylor Swift - Fearless - Music Charts". aCharts.us. Retrieved May 25, 2010. ^ "US Singles Top 100 - March 13, 2010". aCharts.us. Retrieved May 25, 2010. ^ "US Singles Top 100 - April 10, 2010". aCharts.us. Retrieved May 25, 2010. ^ a b "Taylor Swift > Charts & Awards > Singles". Allmusic. Rovi Corporation. Retrieved May 19, 2010. ^ a b c "American single certifications – Taylor Swift – Fearless". Recording Industry Association of America. Retrieved July 6, 2018. If necessary, click Advanced, then click Format, then select Single, then click SEARCH. ^ "Taylor Swift - Fearless (Song)". Spanishcharts.com. Productores de Música de España. Retrieved May 25, 2010. ^ a b "Taylor Swift - Body By Milk". About.com. The New York Times Company. November 6, 2008. Retrieved May 31, 2010. ^ a b "Taylor Swift - 'Fearless'". CMT. Viacom. Retrieved May 30, 2010. ^ "Taylor Swift shimmers in Omaha". Coffey, Kevin. Omaha World-Herald. 28 May 2011. Archived from the original on 30 June 2012. Retrieved August 19, 2011. ^ Herrero, Javier (19 March 2011). "Taylor Swift encandila a unos 4.000 madrileños con su country edulcorado" [Taylor Swift dazzle some 4,000 locals sweetened country]. La Rioja (in Spanish). Grupo Vocento. Retrieved 19 August 2011. ^ Sträter, Andreas (13 March 2011). "Blaue Augen, süße Songs: Taylor Swift in Oberhausen" [Blues, sweet songs: Taylor Swift in Overhausen]. Soester Anzeiger (in German). Retrieved 19 August 2011. ^ Iasimone, Ashley. "All the Surprise Songs Taylor Swift Has Performed on Her Reputation Stadium Tour B-Stage (So Far)". Billboard. Retrieved 19 November 2018. ^ a b Vena, Jocelyn (February 18, 2010). "Taylor Swift's 'Fearless' Video A Love Letter To Her Fans". MTV News. Viacom. Retrieved May 30, 2010. ^ "Spanishcharts.com – Taylor Swift – Fearless" Canciones Top 50. ^ "Chart Log UK: DJ S - The System Of Life". Zobbel.de. Retrieved 2012-06-17. ^ "Year End Charts - Hot Country Songs - Issue Date: 2010". Billboard. Prometheus Global Media. Archived from the original on July 12, 2011. Retrieved August 15, 2011. This page was last edited on 24 January 2019, at 20:49 (UTC).